This December, BW and I are taking a little detour on our Dubai trip to visit Bombay for a couple of days. Saying that I’m slightly excited is an under exaggeration; its more like I’m super-duper, ridiculously elated at the fact that we’re going. I know Bombay isn’t the most exotic nor picturesque location but the history behind it, especially involving the British Empire, is incredibly interesting. Old school Bombay was stunning and classy, and this is clearly reflected in the architecture that you see around the city such as the classic Taj hotel. Before I start a whole history lesson on the Raj, let’s get straight to the food. 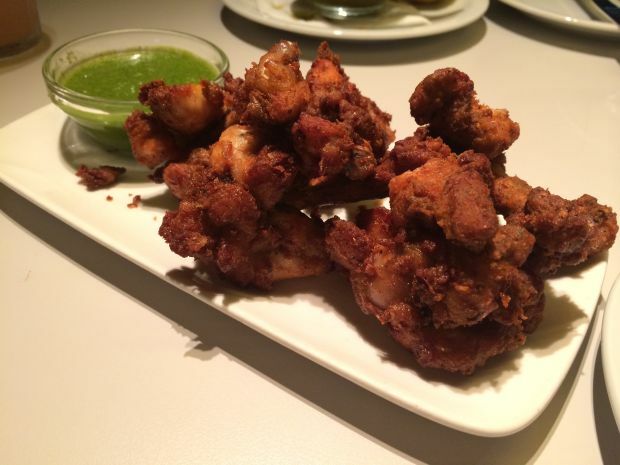 Roti Chai is located just behind Selfridges – the perfect stopover after a Christmas shopping marathon! Both the upstairs and downstairs are delicious but cater for a specific mood. 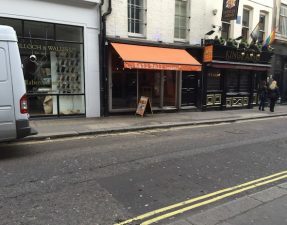 If you’re in the mood for a more casual lunch or dinner, and don’t mind getting a bit hands on, then the upstairs street section is perfect for you. However, those who prefer a more formal affair in terms of their meal, and fancy a wider selection of classic curries, the downstairs section is where you should book. Seeing as BW and I weren’t particularly ravenous (and because I’ve already reviewed downstairs before), we opted to stay upstairs. Little puri shells arrived filled with mini potato chunks and chickpeas. 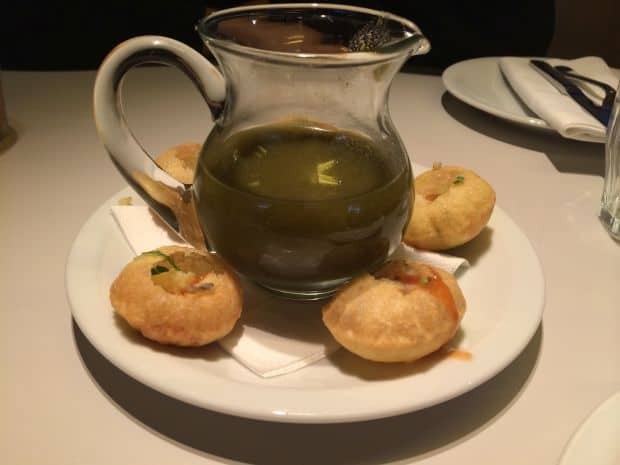 You grab the puri, fill it right up to the top with the jal jeera (cumin-spiced water), and pop the whole thing into your mouth! These were very, very good and had a good spice to them. 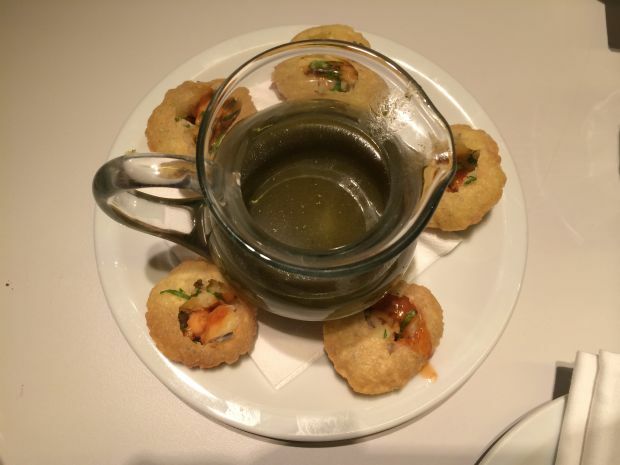 Its quite difficult to get authentic tasting pani puri in London but these were a very good attempt. This was the best dish out of the bunch. Easy to hold chicken wings where the meat had all gathered at the top thus becoming a mouth-watering deep-fried lollipop. When you took a bite you were greeted with a delicious crunch followed by the hot, moist chicken which was really intensely flavoured with Indian spices and a subtle spicy kick. Dunking them into the green chutney just made them even more yummy. 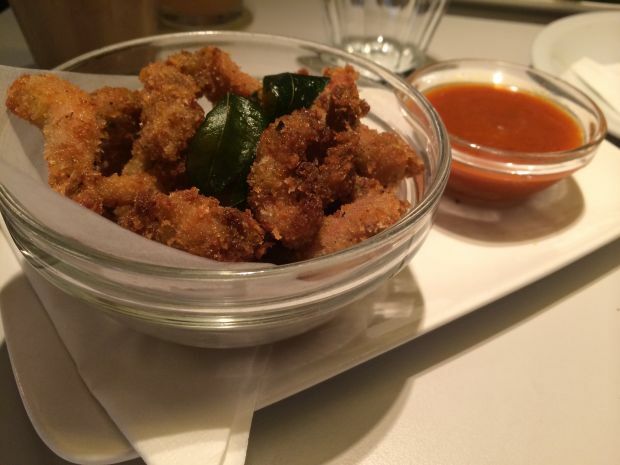 Small chicken strips that had been deep fried with a crispy masala outer layer. 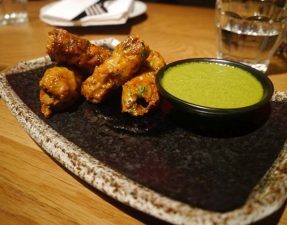 This came with a small bowl of ketchup that had been infused with curry spices – the perfect accompaniment for dunking the chicken strips into. The chicken, although being tasty, was not flavoursome enough particularly for Indian food and needed a punch of spices to make it really stand out. 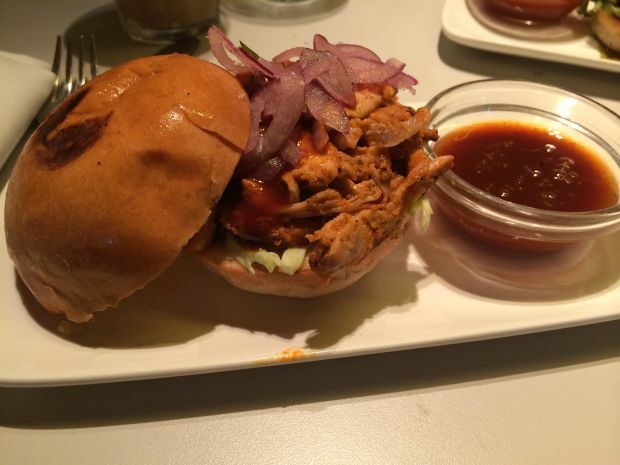 A mountainful of spicy chicken shreds was placed in a soft white bun and topped with sauteed red onions. The chicken was good – moist with just the right amount of spice – however the chopped red onions could have been sliced thinner instead of large chunks. A well seasoned lamb patty that had been topped with green chutney and sweet pomegranate seeds, and placed inside a squidgy white bun. It was an easy to handle lamb slider which didn’t fall apart as soon as you took a bite but managed to maintain its structure throughout. Albeit a little greasy, the minced lamb kebab was firm yet tender, and every bite was moreish. This was the better burger out of the two. As for drinks, I ordered the Cold Coffee [£3.50] which was a great take on the traditional iced coffee but using Indian spiced coffee instead, and BW ordered the Kovalam Beach Mocktail [£3.50]. This was made of ginger ale, lychee, guava and coconut. It was light and fruity leading him to order another glassful. Overall, the total bill amounted to £40.60 for two people excluding service. A decent price for a lunchtime treat in the heart of London, especially as we were beyond stuffed, and I couldn’t fault the service either. The wait staff were attentive and eager to meet every request even when the restaurant was borderline packed out! The restaurant atmosphere was buzzing and full of families and friends enjoying their weekend. The only downside, however, is that you are not able to order food from the downstairs menu if you are seated upstairs and vice versa. 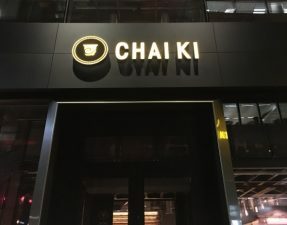 Regardless of this however, Roti Chai is able to deliver close-to-home food, which is perfect for this bitter cold winter! For a thorough review of the formal section downstairs, please see my previous review here. Plenty of parking in the evenings outside the restaurant or around the corner. Halal?I love reading your blogs,my sons so bored after moving here from Dubai….I can explore food for his fancy thanks to you.